"In a parking lot full of AVs, you don't need to open the doors, so they can park with very little space in between," says Professor Matthew Roorda, senior author of a new study in Transportation Research Part B. "You also don't need to leave space for each car to drive out, because you can signal the surrounding AVs to move out of the way." While traditional parking lots are configured for "islands" of cars that can each pull in or out of a spot, an AV parking lot could resemble a solid grid, with outer cars moving aside as needed to let the inner cars enter and exit. 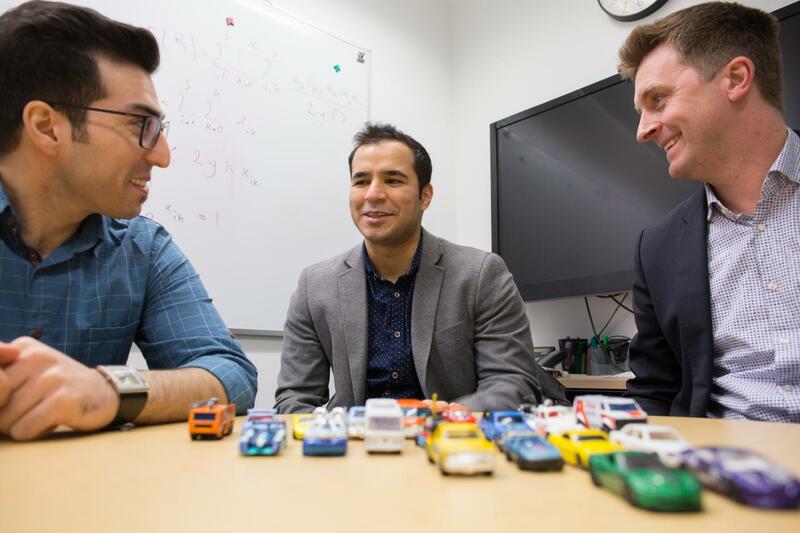 The researchers' challenge was to determine the optimal size of the grid to maximize storage while minimizing the number of moves required to extract any given car. "There's a trade-off," says Mehdi Nourinejad, a recent PhD graduate from the Department of Civil Engineering and the study's lead author. "If you have a very large grid, it leads to a lot of relocations, which means that it takes longer on average to retrieve your vehicle. On the other hand, if you have a number of smaller grids, it wastes a lot of space." Another advantage of AV parking lots is that the design is not fixed. "If demand changes — for example, if you need to pack more cars into the lot — you don't need to paint new parking spaces," says Bahrami. "Instead, the operator can just signal the cars to rearrange themselves. It will take longer to retrieve your vehicle, but you will fit more cars in." Roorda hopes that municipal parking authorities will be able to use their design approach to enhance urban spaces. "Right now, our downtown cores have giant municipal parking lots next to major attractions," he says. "AVs could allow us to both shrink and relocate these parking lots, opening up valuable space in cities." "Right now, we have a lot of cars on the road with just one passenger," says Roorda. "If we locate AV parking lots too far away from major attractions, we could end up with streets crowded with vehicles that have zero passengers, which would be worse." Another drawback is that team's designs only work for parking lots reserved exclusively for AVs, rather than a mix of AVs and conventional vehicles, though Roorda says that a single lot could have both AV and non-AV areas. Roorda and his team also can't predict when the number of AVs on the road will reach the critical mass required to make use of their designs. "We're talking about large numbers of vehicles that can fully drive themselves, with no requirement for a driver to take over if something goes wrong," says Roorda. "There's a lot that has to happen before we get to that stage."